On February 6, 2014, a rare Nintendo Entertainment System Cartridge was listed for sale at the price of $20,000.00 on eBay. Although the price seems high, some may remember a similar cartridge with fairly poor cosmetic conditions sold on eBay on 1/25/14 for $99,902.00 after an auction ended which took in over 300 bids. The aforementioned cartridge is priced at a cheaper $20,000.00, the cartridge has no bidding option and the offer to "buy it now" purchase will end on March 8, 2014. Perhaps because of one of these cartridges sold for such a high price, owners may be more reluctant to sell there own. There is plenty of time left for people to ponder whether or not to purchase the cartridge currently on eBay, but some may wonder why these cartridges are so special in the first place. These NES cartridges are from the Nintendo World Championships, a 1990 gaming competition which was held in 29 different cities across the US. The cartridges were used in the competition itself and were then distributed to finalists. Although many believe only 90 of these grey cartridges were ever made, a former Nintendo employee, Howard Phillips, claims that around 150 of them were made. Approximately 26 gold versions of the same cartridge have also been made, but they lack individual serial numbers and are difficult to authenticate. .The competition involved playing on these very same custom game cartridges which included three games and a timer which would expire after 6 minutes and 21 seconds. In order to play the cartridge both controller ports must be in use by a controller and the player needed to press start on the second port's controller. Players would first play to collect 50 coins in Super Mario Bros. Once this was completed, the game Rad Racer would be launched in which players would need to complete a custom course for the competition. Finally, a game of Tetris would start and it would last until the remaining time expires. After the 6 minutes and 21 seconds is up, a player's final score was calculated as follows: (Super Mario Bros. score) + (Rad Racer score x 10) + (Tetris score x 25) = final score. It should be noted that the games themselves on the cartridge were modified specifically for the competition. Players had 99 lives in Super Mario Bros. and the timer in Rad Racer was fixed at 99 seconds so that a "game over" screen was not possible. However, if a player failed to stack blocks under the top of the playing field in Tetris, the game would end prematurely. 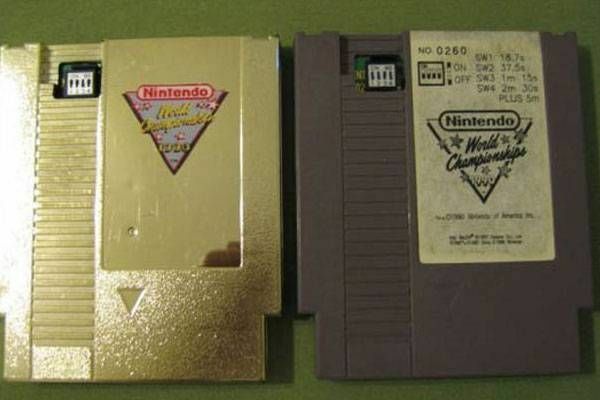 Both the gold and grey versions of the cartridge were modified to have DIP switches on the front of them to select time limits of the game. The competition had three separate age groups (11 and under, 12-17, and 18 and over). Players within age groups competed to qualify for consecutive rounds to eventually make it to their city's final round, in which the top seven scorers from each age group would compete. The top two players from this round would then play against each other to then claim the title of "City Champion" for their respective age group. Each City Champion would then win a trip to the World Finals in Hollywood, California to compete for the World Champion title in their age group. Semi-finalists across these rounds would win items such as trophies, pins, shoes, controllers, cash, and even Power Pads and Gameboys depending on which stage the competition was in. The top winner in each age group took home delicacies such as a then-new 1990 convertible, a 40" television, a fold Mario trophy, and a $10,000 savings bond. .It has been 24 years since the Nintendo World Championship competition and it is evident that the cartridges have some extreme value within the popular market, some even believe these cartridges are the most sought after item in the market for video game collectors. One grey and one gold cartridge were even shown on the History Channel Series, Pawn Stars. Since one of the cartridges was purchased for over 99 thousand dollars, it has held the world record for the most expensive video game sale, however, some still consider this purchase to be a fluke because these grey cartridges normally have sold in the past for around $5,000.00 and the gold ones normally sold for around $18,000.00. Perhaps their value has greatly increased or it was just a matter of heat of the moment. On a side note, if the common person wants to ever play on one of these cartridges, he or she can purchase a working replica for around $120.00 which operates just as the original does.